…..but in the case of the women I ran with yesterday at the Gadsden Correctional Institution in Gretna, Florida, safety pins held a lot of symbolism for me. I am not sure why I end up writing about safety pins so much (such as this post and this guest post on Running Toward The Prize.) I suppose someday I will own a race number belt and won’t be writing about safety pins anymore. I didn’t think much of it yesterday when I pinned my number on at the inaugural Gadsden Correctional Institution 5K. I’ve pinned numbers on for races countless times before. Let me give you a little background to explain why I was standing inside a correctional institution in the first place. I immediately emailed David after reading the article and told him that I would be interested in participating in the 5K if it ever came together. In true Gulf Winds “get it done” fashion, it came together rapidly. As it turns out, it takes quite a process to get 20 civilians (some of whom were men), into an all-female correctional institution. “Quite a process” includes completing a background check form, heeding instructions about what to bring (driver’s license or no entry), how to dress (men must have shirts, no “sports bra only” styles for women) and how to pay our “entry fee” (donate a new or used book about running). After we went through the initial security checkpoint, we were taken to the recreational field. This field is the only place at the facility where the women are usually allowed to run. 10.5 times around makes a mile. The women were in uniform shorts and tshirts. I learned later that they have a choice of three styles of athletic shoes from a specific catalog. For all the time most of us spend obsessing about heel lift, motion control, arch support, and other intricacies of running shoe design, it was a sign that these women love running that they will run in the only shoes available to them, shoes that do not appear to be specifically designed for running. You could argue that a 5K is a 5K. Distance is what it is. But I witnessed more than a group of runners traversing a typical race distance yesterday. Wanna know where I was at this exact same time last year? Receiving chemo. It was so nice to run on the pavement! (For this race only, the group was allowed to run in a different area of the facility. We ran around their usual recreational field loop once, then ran four laps of a route around the perimeter of the facility but inside the secured area, of course.) The route ran past groups of women/staff cheering us on, past the gorgeous flower beds created and cared for by inmates in the horticulture program, past the most determined-to-hydrate water station volunteers I have ever seen at a race. The real magic (for me) happened after the race. Completing this 5K was a very big deal for these women. “I did it!” was the exclamation of many of the finishers. One woman had never run longer than 1.5 miles and had gotten added to the race roster at the last minute. She was so proud. I had an extended conversation with a woman named Michelle who plans to be a fitness trainer when she gets out later this year. She said, “the day I get out, I am doing yoga at the beach, either at sunrise or sunset.” (There is yoga offered at the prison, along with aerobics and other wellness activities.) She couldn’t wait to write her family to tell them about the run. I talked at length with two women who had lots of basic questions. How long is a half marathon? How long is a marathon? How do you do a Disney race? What do you listen to when you run? (They all had transistor radios and headphones; they said they hope to get mp3 players.) Do you have to belong to a running club to do a race? I talked with a woman who is my age (47) who talked about recidivism and minimum mandatory sentences. She said she has seen women return to the institution 2 and 3 times. She talked about the 5:30 a.m. wakeup of fluorescent lights coming on overhead. She said once she returned home, she would hope her family understood when she just stood in front of the refrigerator and cried, happy to be able to eat what she wanted when she wanted to. I learned a lot in a couple of hours about the impact of prescription drug abuse and minimum mandatory sentencing. As usual, I was toward the last of the finishers, but I still got to hear a few ecstatic cries of “I did it!” I also heard “This was my first marathon.” Who am I to correct? It may not be 26.2 physical miles but this feat was a race about more than movement of the feet. The women shared about the programs they are involved in at the prison. There are several programs that involve animals, including greyhound rehabilitation and training dogs for Canine Companions for Independence. The inmates who work with these animals explained what a sizable privilege it is, and that they are held to extremely high standards behaviorally in order to maintain that privilege. When the warden presented awards (watches) to the top three inmate finishers, he gave a concise and impassioned speech to everyone who had participated, reminding them that even if they didn’t win a prize, they should be proud of what they had done; he talked about expanding the running program so it was easier for women to keep up with their progress. He reminded them that they had their race numbers as keepsakes. If I as a community member was thanked once for coming, I was thanked a hundred times. I would go back in a heartbeat. Such incredible conversations. Such testimony to the ability of running to empower people. I heard the women reminding each other to return the safety pins that had been holding their numbers on. They weren’t allowed to keep them. My friend Elizabeth said she had returned hers too, so I decided that if they couldn’t keep theirs, it was probably a good idea to turn mine in also. By the time I came to that decision, there was no one left to turn them in to. I arrived home with four extra safety pins. Along with the safety pins, I brought home images firmly burnt into my head of women who have surrendered their civil freedom (for now) but found freedom of body, heart, and mind as they traversed 3.1 miles. 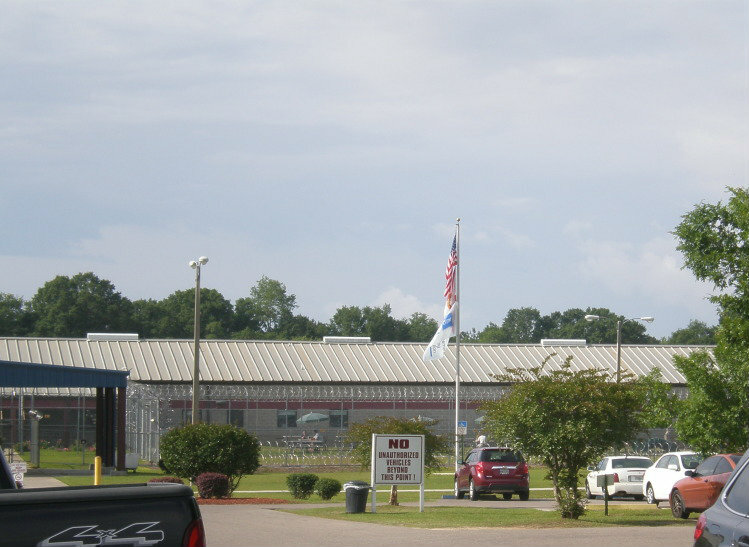 This entry was posted in Gadsden Correctional Institution, Gulf Winds Track Club, Running, Wally Lamb by Paula Kiger. Bookmark the permalink. Beautiful post, and wonderful sentiment. You are such an inspiration! Wonderful words, Paula…wish I could have been there! Thanks for doing this and sharing about it! Tears in my eyes reading your story…you are an inspiration to those women there, especially my daughter…she's been there for over 6 years and with about 6 more years to go, its events like this that give her strength to make it through another day. thank you.